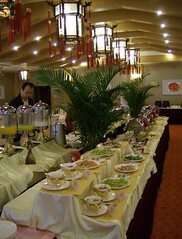 The morning breakfast buffet at the Foreign Experts Building Hotel in Beijing was free and exceptional. Rice, vegetables, wonton, Bao, eggs cooked to order, bacon, sausages, and much more made the morning meal a huge feast. FEB was an exceptional hotel at the price we paid – about $80 per night US due to some special deal from our Beijing Friend Kevin Wu, the best dentist in Medford Oregon. We had a huge 1BR suite. Even Hotels.com pricing was more than double this and rack rates were about $500 US per night for our large room . This entry was posted in Beijing, china, hotels, not yet categorized, tourism, travel. Bookmark the permalink.